What are the reasons that make consumers choose certain products or certain brands over others? Basically the things that attract us to a particular product are its unique sensory properties. Depending on whether these fulfil our “ideal” levels of sensory satisfaction to a greater or lesser degree, we like them more or less. If we choose to focus on chocolate, the main properties that differentiate a good chocolate from a bad one and that encourage a consumer to choose one brand over another are texture, flavour and aroma. Chocolate is most popular cocoa product among consumers. It is associated with pleasure, enjoyment and addiction, since it contains components with stimulating properties such as phenylethylamine. This acts in the brain by triggering a state of euphoria and emotional well-being. That is why in moments of sadness, depression or feeling down, our body feels the need to eat chocolate. As far back as in Mayan and Aztec cultures, chocolate was considered the food of the gods. Only kings and warriors could eat it and it was even used as currency. Hernán Cortés brought cocoa to the Iberian Peninsula in 1528 and it was a status symbol in Paris in the sixteenth and seventeenth centuries, becoming the fashionable drink of the aristocracy and upper classes throughout Europe during the following centuries. The sensory properties of chocolate (aroma, flavour and texture) do not depend exclusively on the cocoa beans used, but can be modified throughout the production process. Biochemical modifications can occur that change the properties of the original bean both during the ripening period (depending on the weather) and during the post-harvest process with the thermal reactions generated by roasting and conching the beans. However, scientists have not yet determined exactly how much each stage of the production of the beans influences the final aroma, flavour or texture of the chocolate. Ordinary or “forastero” cocoa is the variety grown in most of the world and accounts for 80% to 90% of world production. It has a high yield due to its high resistance to pests and droughts, but its flavour is strong and bitter. “Criollo” cocoa is the least common variety due to its low yield. It is grown mainly in Venezuela, Sri Lanka and on some Indian Ocean islands such as Madagascar. It is very susceptible to diseases and pests, but it has a smooth taste with certain nutty notes. “Trinitarian” cocoa is a hybrid variety born of the two main types and represents 10-15% of world production. Even though the factors that influence its sensory properties are still unclear, increase in chocolate production and the consequent increase in specialized niche chocolate markets have meant that variations in flavour and aroma, as well as the factors causing them, have great commercial importance. Today, cocoa is being researched intensely all over the world, with researchers trying to prove the beneficial health effects of its nutrients. In fact, in sixteenth-century Europe, cocoa was already used as a medicinal remedy due to its unique properties, and later the naturalist Alexander von Humboldt would state that “nowhere has nature concentrated so many valuable nutrients in a space as small as a cocoa bean”. Pacari chocolate was recognized this year as the best bar chocolate in the world and won 150 awards in the latest editions of the International Chocolate Awards. It is an Ecuadorian chocolate, which is organic and produced by local farmers. In an interview for The Luxonomist, Santiago Peralta, the founder of the brand, explains that what makes his chocolate a unique product is its origin and production in iconic areas such as Peru, Ecuador and Colombia. However, he does add that another success factor is undoubtedly the introduction of exotic and eccentric flavours added to the chocolate such as Cusco salt or chilli peppers, which are common products in Latin American cuisine, but very exotic for European consumers. According to Peralta, the sheer number of “Europeanized” chocolates available (with dried fruits or with milk) has made it easier for Pacari and his 35 “Latin American” flavours (chocolate with passion fruit, with Cusco salt or lemon verbena) to enter a European market packed with consumers who are looking for new flavours. 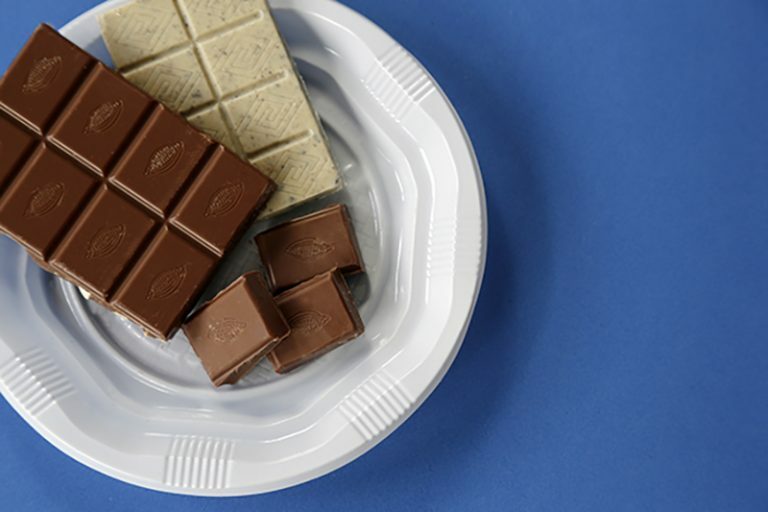 Often food products, such as chocolate, are associated only with our sense of taste, and the act of eating is considered to be something that depends only or mainly on the taste buds. Over the last few years, this concept has been challenged, and the role of other senses such as smell and touch have been highlighted in the act of eating and enjoying food. Specifically for chocolate, as we have seen, these other senses play a very important part in the full appreciation of the qualities of cocoa. A great example of this call for sensory awareness was the party held in March 2016 by the Belgian chocolate brand Godiva for its 90th birthday. The event was organized in the format of a sensory party where all the guests could taste different varieties of chocolate, textures and aromas, as well as watching some of Godiva’s products actually being made. This event put on by the much loved, historic chocolate brand emphasized the importance of the senses in chocolate consumption. It underlined that eating chocolate is an act in which not only the sense of taste is involved, but that other senses such as touch or smell play an essential part in fully enjoying the product. No Replies to "The secret of chocolate’s success"